Primary diffuse leptomeningeal gliomatosis (PDLG) is an uncommon diagnosis at any age. It has been described in patients as young as 2 years to those aged 74 years, without gender predilection. This fatal neoplastic condition is characterized by the absence of a primary tumor in the brain and spinal cord parenchyma. There is the sole involvement of the leptomeninges. Since its description in 1923, less than 100 cases have been reported in the literature. These tumors are thought to arise from ectopic glial cell rests called HLNT (heterotopic leptomeningeal neuroglial tissue). Its diagnosis solely rests on meningeal biopsy of the affected region and is confirmed by immunohistochemistry. We present the history of a patient who had a short period of symptoms attributable to raised intracranial pressure followed by unconsciousness. A 15-year old male patient had a history of vomiting, headache and diplopia of 5-day duration. The headache was severe and holocranial, and by the fifth day, he became unconscious. There was no history of seizures. He was referred to our hospital in an unconscious state with a Glasgow Coma Scale (GCS) score of 7/15. Computed tomography (CT) scan showed obstructive hydrocephalus with panventricular dilation [Figure 1]. There were multiple hypodensities within the brain parenchyma mostly in the basal cisterns. An emergency external ventricular drain (EVD) was placed, after which his GCS score improved to 12 after 3 days. After a week, his consciousness improved, and therefore, his EVD was converted to a ventriculoperitoneal shunt. Simultaneously, a biopsy of the leptomeninges was also obtained from the site of the shunt insertion at the Keen's point. 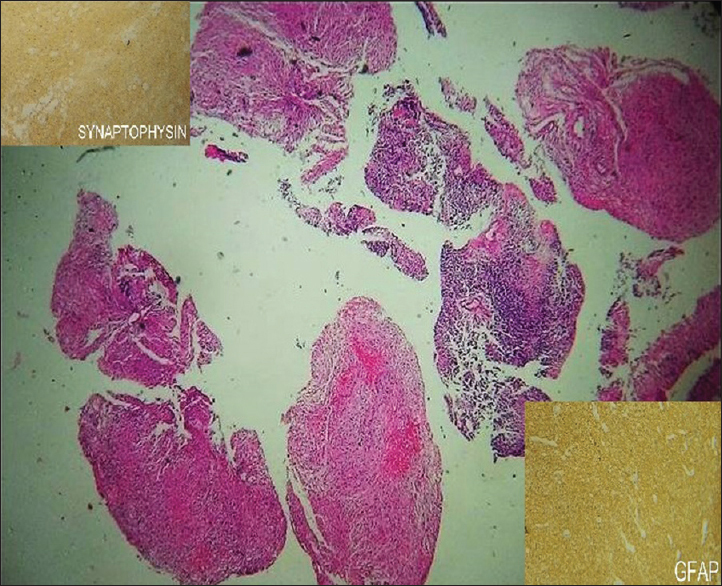 His histopathology was inconclusive and showed gliosis with infiltration of inflammatory cells. His neurological examination that was conducted on his gaining consciousness revealed left lateral rectus palsy, left facial nerve palsy, and grade 4/5 power in all four limbs. At that time, he also complained of severe pain in the nape of the neck and upper dorsal region. Fundoscopy showed severe papillodema with retinal hemorrhages involving both the eyes. The cerebrospinal fluid (CSF) analysis was inconclusive with the protein level being protein 10 mg/dl, and the glucose level being 92 mg/dl, with a few red blood cells (RBCs), and two neutrophils. No malignant cells were seen. Reactivity for tuberculous antigen was negative. Magnetic resonance imaging (MRI) scanning of the brain showed multiple small heterogeneously enhancing lesions predominantly in the basal part of the brain involving the suprasellar and left cerebellopontine cistern with cisterna magna along with associated hydrocephalus [Figure 2]. 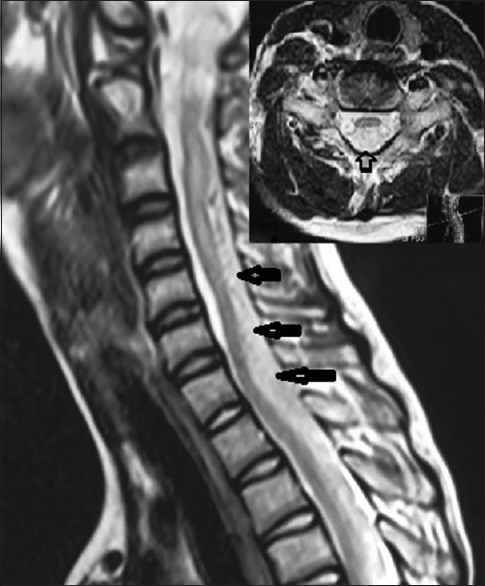 A detailed MRI of the spine showed multiple nodular deposits in the intradural extramedullary region coating the spinal cord, extending from the cervicomedullary junction upto the distal end of the spinal canal. The lesions were hyperintense on T2- and isointense to hyperintense on T1-weighted images with contrast enhancement. The lesions were more pronounced in the cervicodorsal region with cord compression present at the D1 level [Figure 3], along with altered signal intensity involving the dorsal vertebrae at the levels D1-4. During his course in the hospital, his weakness gradually worsened to grade 3/5 in the upper and lower limbs and he was not able to stand or walk without support. The intensity of pain in the neck and upper back also increased. Serum electrophoresis was done which was negative for any abnormality. A biopsy of the lesions seen on the MRI spine at the most prominent part of lesion, which was at C7/D1 region, was planned. A C7-D1 laminectomy was done and the lesion was found to be soft, friable, and moderately vascular and was very similar to the gliomatous tissue. 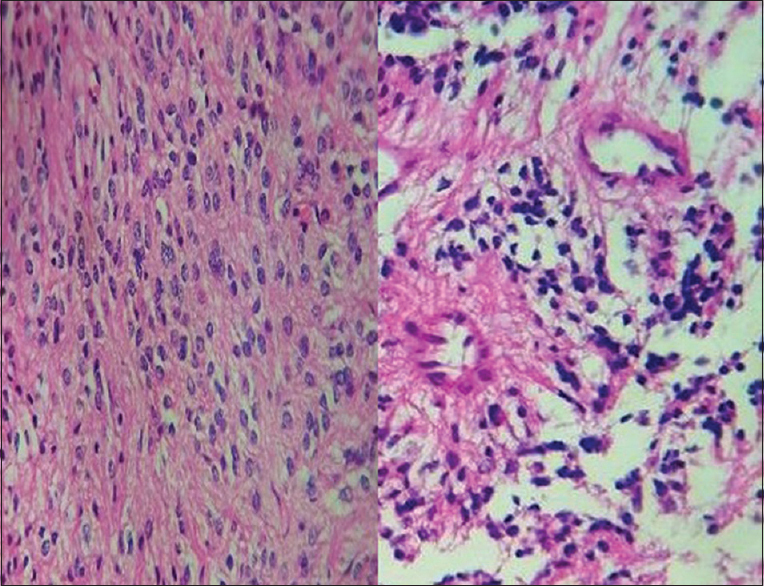 Histopathology revealed a neoplasm composed of two cell populations, one resembling oligodendrocytes and the other neurocytes, with a tendency to form pseudorosettes. Immunohistochemistry was performed which showed glial fibrillary acidic protein (GFAP) and synaptophysin positivity, based on which a diagnosis of leptomeningeal gliomatosis was made [Figure 4] and [Figure 5]. The patient was sent for radiotherapy but there was a considerable delay of a month. Meanwhile, his general condition deteriorated further and weakness in his upper limbs worsened to 2/5. He finally succumbed to the disease in a week's time. PDLG is an uncommon and unique neoplastic condition. It is thought to arise from astrocytic precursor cells called HLNT, which become embedded in the leptomeninges during embryogenesis. These cells are mostly astrocytic; however, they may also consist of oligodendrocytes. Accordingly, primary leptomeningeal oligodendrogliomatosis has also been reported in the literature., HLNTs are found in approximately 1% of autopsy specimens and in 25% of specimens with congenital malformations of the brain. PDLG most often affects adults rather than children with a male predominance, as was seen in a recent review by Tauziede-Espariat et al. The most common presenting symptoms are headache and nausea/vomiting. Thus, a clinical scenario with which it usually presents overlaps with many common diseases. Consequently, it is not surprising that patients have been treated for chronic meningitis, tuberculosis, and sarcoidosis in many instances. The short history and rapid disease progression in our patient led us to think of the possibility of a posterior fossa tumor, which is also common in the age group in which our patient presented. In the natural history of PDLG, the usual course of disease duration prior to presentation has been reported to be 3 weeks to a few months.,,, Although PDLG can present as an acute emergency with a clinical picture of intraventricular hemorrhage, Our patient had a short course of illness of 4-day duration before he presented to us in an unconscious state. The poor neurological condition of our patient was due to obstructive hydrocephalus which was relieved by instituting an EVD initially, and consequently a VP shunt. Obstructive hydrocephalus has been a prominent feature in the published case reports available in the literature. The biopsy which was taken from the site of shunt insertion was inconclusive. This was more likely attributable to a poor selection site for biopsy as the lesions were predominantly located over the basal parts of the brain. Such instances of negative biopsies are common with PDLG. In addition to his neurologic symptoms, there was generalized bone pain which was more in the neck and upper back. PDLG has been reported to present with neck pain, but unlike in our case, this reported case was in an elderly patient. Bourne et al., reported a case similar to our patient with a similar radiological image of hydrocephalus with an associated cervical lesion. However, they performed a biopsy from the intracranial compartment after CSF diversion to clinch the diagnosis of primary leptomeningeal oligodendrogliomatosis. The immunohistochemistry of PDLG varies in different series and depends upon the morphological characteristics of the primary tumor which could be either an astrocytoma or an oligodendroglioma. In a review by Dörner et al., in which he summarized 30 cases of PDLG published in the literature from 1957 to 2009, 14 cases were positive for glial fibrillary acid protein (GFAP). Other markers that may be helpful in diagnosis are S100 as well as epithelial membrane antigen (EMA). The current World Health Organisation (WHO) update on classification of brain tumors does not mention where this entity can be grouped. It should be coded by its location, histological diagnosis, and grade. The molecular markers that have an important role in the diagnosis of PDLG deserve a special mention. None of the patients in the retrospective series by Tauziede-Espariat et al., that consisted of 6 patients had an isocitrate dehydrogenase (IDH) mutation or 1p, 19q codeletion. However, an isolated 1p deletion was present in two cases, whereas a 19q deletion was present in another case. PDLG is a very rare disease which can masquerade many chronic illnesses. A good understanding of this unique entity is necessary so that any delay in diagnosis is avoided, and an early treatment may be instituted for obtaining better results. Bourne TD, Mandell JW, Matsumoto JA, Jane JA Jr, Lopes MB. Primary disseminated leptomeningeal oligodendroglioma with 1p deletion. Case report. J Neurosurg 2006;105:465-9. 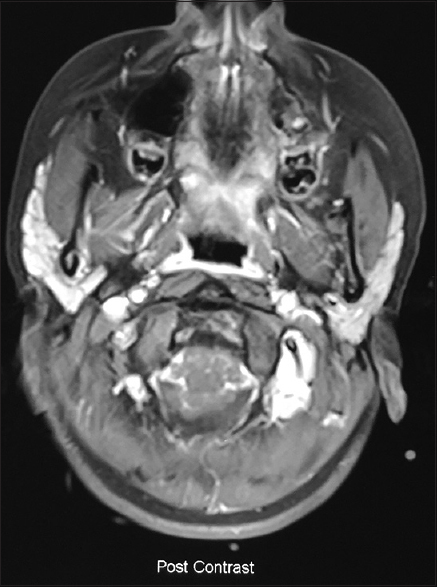 Heijink DS, Urugun K, Sav A, Seker A, Konya D. A case of primary diffuse leptomeningeal gliomatosis predominantly involving the cervical spinal cord and mimicking chronic meningitis. Turk Neurosurg 2012;22:90-4. Tauziede-Espariat A, Maues de Paula A, Pages M, Laquerriere A, Maulin T, Grill J,et al. Primary leptomeningeal gliomatosis in children and adults: A morphological and molecular comparative study with literature review. Neurosurgery 2016;78:343-52. Jabeen SA, Chowdhary AH, Kandadai RM, Uppin MS, Meena AK, Borghain R,et al. Primary diffuse leptomeningeal gliomatosis: An autopsy case report. Ann Indian Acad Neurol 2014;17:227-30. Keith T, Llewellyn R, Harvie M, Roncaroli F, Weatherall MW. A report of the natural history of leptomeningeal gliomatosis. J Clin Neurosci 2011;18:582-5. Ko MW, Turkeltab PE, Lee EB, Gonatas NK, Volpe NJ, Moster ML,et al. Primary diffuse leptomeningeal gliomatosis mimicking a chronic inflammatory meningitis. J Neurol Sci 2009;278:127-31. 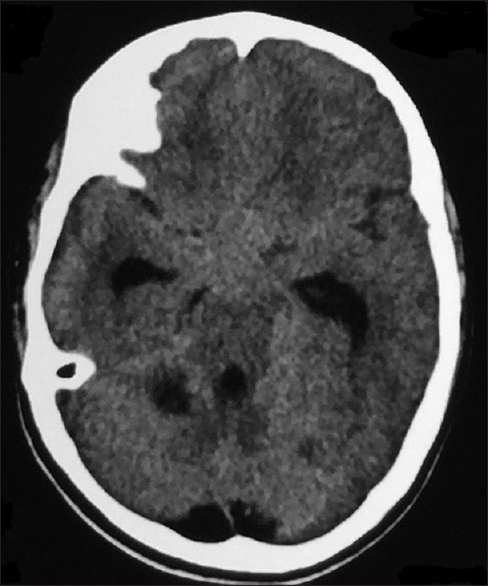 Zhu M, Zheng JJ, Zhu Y, Wan H, Wu Y, Hong D. Diffuse leptomeningeal gliomatosis initially presenting with intraventricular hemorrhage: A case report and literature review. BMC Neurol 2015;15:77. Dörner L, Fritsch MJ, Hugo HH, Mehdorn HM. Primary diffuse leptomeningeal gliomatosis in a 2-year-old girl. Surg Neurol 2009;71:713-9.
Cooper IS, Kernohan JW. Heterotopic glial nests in the subarachnoid space; Histopathologic characteristics, mode of origin and relation to meningeal gliomas. J Neuropathol Exp Neurol 1951;10:16-29.